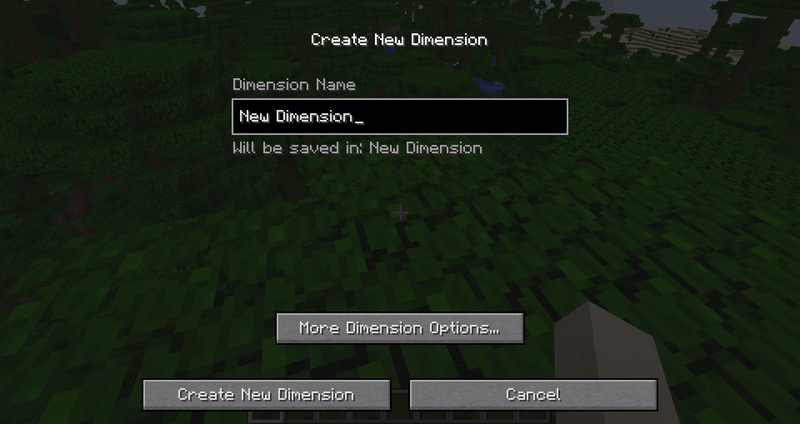 This mod allows you to create custom dimensions using the vanilla create world gui. Therefore you can use the vast customization options available there for new dimensions. 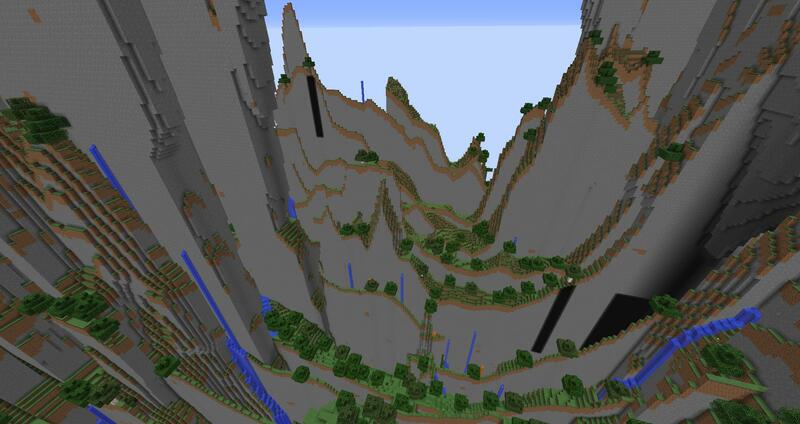 You can for example use it to create Mining Worlds or Void Worlds for your players to use without using survival mods like RFTools or Mystcraft. This mod does not add any content to the game but is entirely command based (Besides the creation of dimensions). "/simpledimensions create" : Opens the GUI to create a dimension. If you are finished customizing press "Create New Dimension" to create your dimension. "/simpledimensions delete <dimensionID>" : Deletes the dimension with the id dimensionID. This only works on dimensions from this mod. Be careful as the command immediately deletes the dimension & the dimension folder. 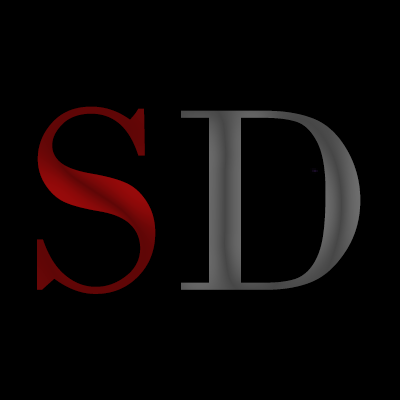 "/simpledimensions list" : Lists all dimensions from this mod with their respective ids. "/weatherd <dimension> <clear|rain|thunder> [duration in seconds]" : A dimension sensitive version of /weather. The vanilla command only sets the weather for the overworld. "/timed <dimension> <set|add|query> <value>" : A dimension sensitive version of /time. The vanilla command sets the time in ALL dimensions. "/tpd [target player] <destination player> OR /tpd [dimensionID] [target player] <x> <y> <z> [<y-rot> <x-rot>]" : A dimension sensitive version of /tp. The vanilla command can't teleport players / anything between dimensions. By default SimpleDimensions starts to search for free dimension ids at 30.000, however this can be configured in the config file if you desire a different range of ids. Wish there was one for 1.7.10 because I have like a core mod that is only for 1.7.10 and it is very important. You can i teleport entities from cars mod 1.12.2 entre dimemsões ????? How do you get to the new dimensions? Do you need another mod? Small Questions, where are the dimenson saved? Is possible, using configs, to precreate some custom dimensions at world start? If yes we also could pre-link some SP corner materials to a certain DIM, what could allows non-ops/non-cheating players to create portals similar to nether without needing to do /tpd first to create the other end. This looks like just the mod I've been looking for to go with SGCraft to make other worlds to stargate to! Thanks a lot for making this! For some reason the world is not generating for me. Or the dimension to be correct. Any thoughts? I've Googled a ton and I can find no information on how to fix this. My Forge server allows a dimension to be created easily with no problems but using the /tpd command to teleport to a Simple Dimension crashes the server and obviously kicks the client. The client can then no longer join the server until that Dimension is deleted. Attempting to fails due to "Internal Server Error" but the server does not crash. Here is the server crash log. Any help would be truly appreciated. This is the last step before my server will be where I want it for my group to play on, so close! EDIT: I just created a new server with no other mods on it using the latest RECOMMENDED version of forge, which is 2655. I can now teleport easily. I'm going to start adding mods and if it breaks again I'll report back with what is conflicting. 2nd EDIT: I could not find any conflict, perhaps it was a version issue though I thought I was running the latest versions. Clean install with over 100 mods freshly added and it is working great. Though I am unable to delete any dimensions for some reason. An issue I'm having is that when I'm in one of the simple dimensions worlds, a large red message that says "No Destination Selected" is on my screen and only goes away when I warp to some other dimension that isn't one of the SD ones. I have a hunch that this issue may be Advanced Rocketry related, but I'm not sure. And has the <y> and <z> transposed from previous versions, tends to cause a fell out of world respawn until you realise this has changed. The @p[x=<x>,y=<y>,z=<z>,r=<r>] part allows for area targeting of the teleport effect, for example 5 squares in a 3x3 + would use the middle co-ordinates and r=2, the r=1 of the co-ordinates and the next square in the radius out. Set up the destination as 1 block off of a return beacon and have it arrive 1 block off the initial beacon for a 2 way toggle-able matter transporter. Have some version for minecraft 1.12.1? I posted this bug for the Twilight Forest guys but I thought I'd put it here as well in case you can do something from your end. This is for 1.12.2 and as I said, I'm not sure it's your issue, just seeing if you have insight. Not sure if this is an issue with your mod or the mini-map mod I have. Using Mapwriter 2 by VectronDiablon (MapWriter-1.10.2-2.6.19.jar and SimpleDimensions-MC1.10-1.3.jar) and every time I switch to one of the new dimensions I made the map thinks I'm still on the Overworld and tries to render both maps at the same time resulting in an odd flicker effect. I know it's getting confused by the new dimension because Mapwriter 2 also has a large map feature and when viewing this you can specify which dimension to look at; it's always set to 0 when I view the map in the Overworld or one of the dimensions I made. 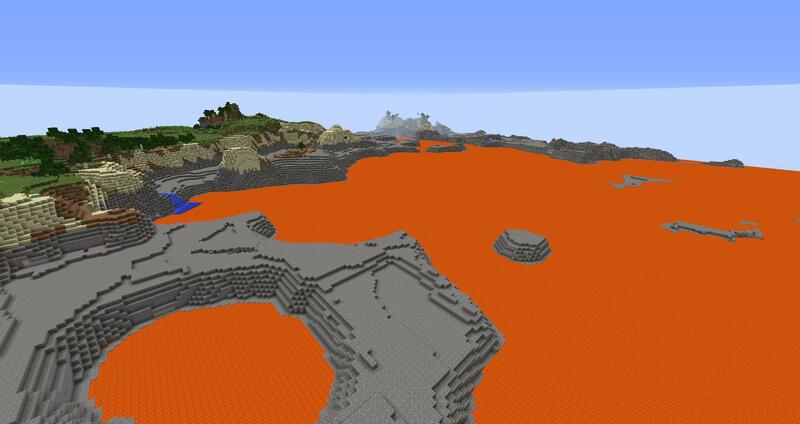 The Nether works fine with the map. Edit: I switched to Xaero's Minimap (Xaeros_Minimap_1.13.6_Forge_1.10.2.jar) and I do not get that flicker effect in the minimap when switching to a dimension created by your mod, but Xaero's Minimap doesn't offer that large map view nor does it offer the ability to look at the discovered map for any dimension you know the number for. Based on this, I think the issue is with Map Writer 2. I think it isn't designed to look for non-standard dimensions, or if it is it's not looking in the ID range you use. if i try to use BoP for a new Dimension, the "Customize"-Button doesnt work. Is there anyway to spawn animals in the dimensions not just villages ? Thank you for new version for 1.12! It works fine now.